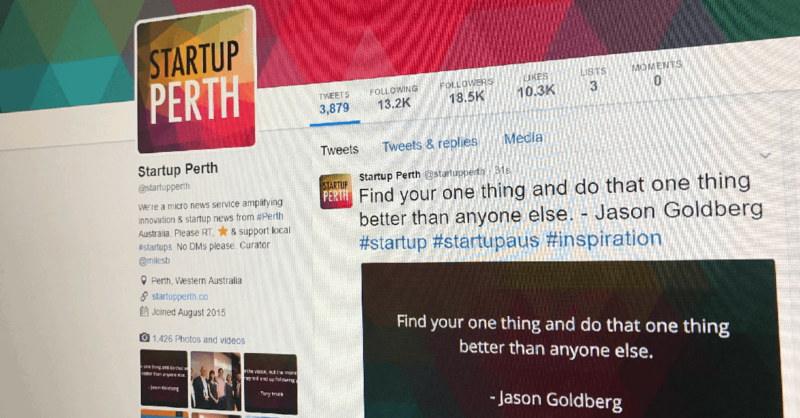 Since way back in August 2015, I’ve been running what I call a ‘micro news service’ on Twitter, called Startup Perth. Whilst it has a single page website, all the activity happens on the Twitter account. It was started to raise further awareness of Perth’s innovative companies. Startup Perth uses a combination of both automation, and manual checking once or twice a day, to share news and information about the Perth startup ecosystem. I wrote about it before, back on Promoting Perth Startups. Over the last 19 months since it began, I’ve attracted 18,545 followers to the account, making it by far the most followed for Western Australian startup and innovation news. In fact, the nearest three Twitter accounts, added up, make up less than a third of the Startup Perth followers, so something about this account is doing well. So, what did it share? Well, it shared mostly news and announcements from Western Australian startups, including links to over 1,900 blog posts, 1,426 photos and videos, inspirational quotes and more. The 1,928 manual tweets were me, typically re-tweeting something a local startup tagged the account in, or found on one of their feeds, such as the example above. At one minute per tweet, that’s taken me roughly 32.5 hours to do. The tweet automation checks against 50+ startups that have blogs with RSS feeds, and then posts their latest blog post, with a link and hashtags, such as this example, below. There were 50 RSS feeds being monitored, and out of those, five didn’t post anything in the last 20 months. There were another 38 feeds that were only tweeted between 1 and 84 times. That totals 883 tweets in total. The entire list of feeds that Startup Perth has been watching is at the footer of this post, for your perusal. As well as the 32.5 hours of manual re-tweeting and sharing, there was around 1-2 hours per month, checking feeds, answering questions, and other administration. All up, this side project has cost me in hard money, $440.00 in total. To be fair, I’ve never gone hunting for any sponsorship or support. In fact, it is a little perplexing for me how I should approach any sponsorship; what do they sponsor? I guess I could have a paid to be included feed, as long as the content was on topic, or a weekly/month ‘This feed supported by SPONSOR NAME’ type arrangement. Having done all the above sums, spending 50 hours and $440 every 20 months for a side project that doesn’t give me any financial gain does seem a little daunting to continue. I do love helping fellow startups out, and never started with the plan of making this some profitable activity, though I would be keen to get something to cover costs. At this stage, I rate the financial success of this side project a big fail, however I’m continuing for the meantime, whilst I ponder any future it may have. If you have any keen thoughts, or want to berate me for wasting my time, please comment below. Here is the list of the 45 Perth startups who did get some content out, via their RSS feeds I am automatically monitoring. Well done for this lot getting some promotion out there. Thank you so much for promoting the local ecosystem, Miles. I for one, appreciate the efforts and expense you go to.